On June 9, 2018 Dr. Sebag delivered an invited lecture at Harvard Medical School in Boston. The annual meeting of the department of Ophthalmology was held at the Massachusetts Eye & Ear Infirmary, where Dr. Sebag trained as a resident in Ophthalmology and as a vitreo-retinal fellow with Charles Schepens and associates. The lecture was entitled “Vitreous – not just through it”. 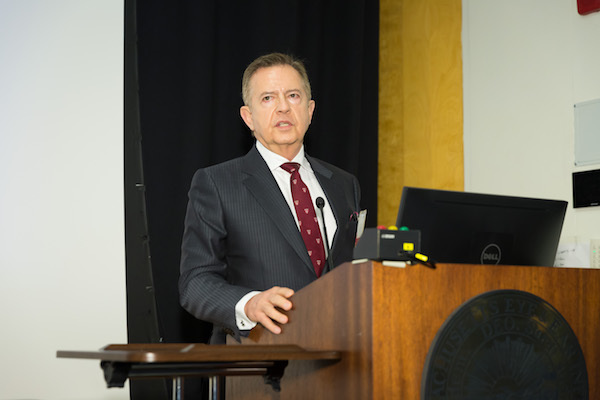 “Too many of our colleagues underestimate the importance of vitreous, so the title of the lecture was intended to encourage researchers and clinicians to investigate vitreous and consider its important role in ocular health and disease. That’s the reason I entitled my most recent book “Vitreous – in Health & Disease”. The lecture reviewed Dr. Sebag’s extensive history of discoveries and developments to advance our understanding of vitreous and its role in retinal disease and vision. These studies have identified a role for vitreous in age-related macular degeneration, retinovascular diseases such as diabetic retinopathy, retinal detachments, and vitreo-maculopathies, primarily macular pucker and macular holes. New therapies that have been developed were described, most recently the treatment of clinically-significant vitreous floaters, a condition now called Vision Degrading Myodesopsia. “It was very gratifying to stand at the podium where my professors stood many years ago and taught me about the eye and vision. During those years I stared up at that podium many times, but now I was on the other side lecturing to Harvard students and faculty. Oddly, the auditorium seemed much smaller than I recalled. I guess that happens often in life”, recounted Dr. Sebag.